1. In a blender, blend all of the ingredients until smooth as possible. Can be refrigerated for up to 10 days. 2. Use as a dip for crackers, pour overtop veggies, use with noodles in a stir fry or as a dip for spring rolls. Delicious veggie rolls! The cilantro ginger sauce sounds amazing. Your description of the sauce alone sold me on this one. 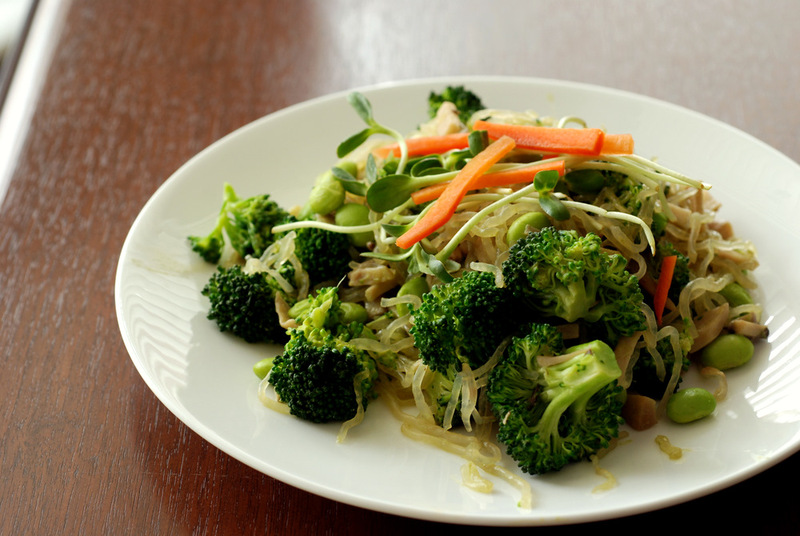 I bet it would be amazing with zucchini noodles – raw zucchini has a slightly nutty taste to me. I’m in the love cilantro camp. It’s so crazy to think those that detect a “soap” taste in it have a genetic thing that causes it! Oh this sauce looks so good! I’m definitely in the love camp. I agree, it’s a love it or hate it kind of deal, though some people are ok with it cooked but not raw (or vice versa) – the flavour changes quite a bit. I have a bunch of cilantro in my fridge right now and I think I know where it’s going! Wow that sounds gorgeous. I’m also a massive fan of cilantro (coriander we call it here in the UK) so I’m sure I will absolutely love this recipe. I’ve made this as a dipping sauce for salad rolls and thought it was great. I didn’t add the cilantro or basil last time, but have them both to add now. I’ll also cut down the agave, as you did, next time I make it. I’ve found some of her recipes are too heavy on the agave for me. Yeah, some of her recipes have a bit too much salt for my liking, too, so I usually add to taste. Her recipes always seem to work so well, though. 🙂 have any other recipes you recommend? Well I’ll probably go at the sauce initially with a spoon…and after that, perhaps I’ll have to get to these wraps! They look delicious! 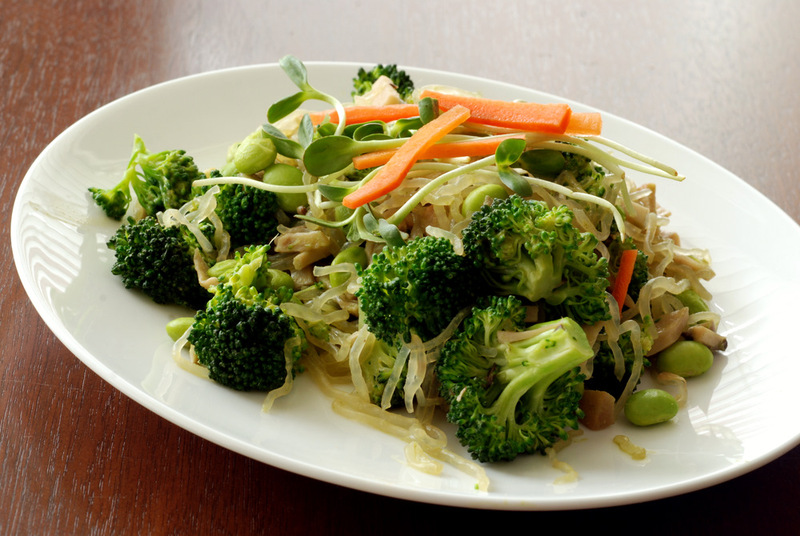 And seriously, are the kelp noodles seaweedy? Or slimy? I see them in your blog and the store and I’m afraid I’m not going to like them. Help? Advice? Yay for collard wraps!! of all the greens, I think young collards are my favourite. Everyone always thinks they will be tough, but they aren’t! Thank you SO much for that detailed explanation! I’m not scared anymore! I’ll let you know how it goes. Excited! I am sooooooo drooling over the sauce. 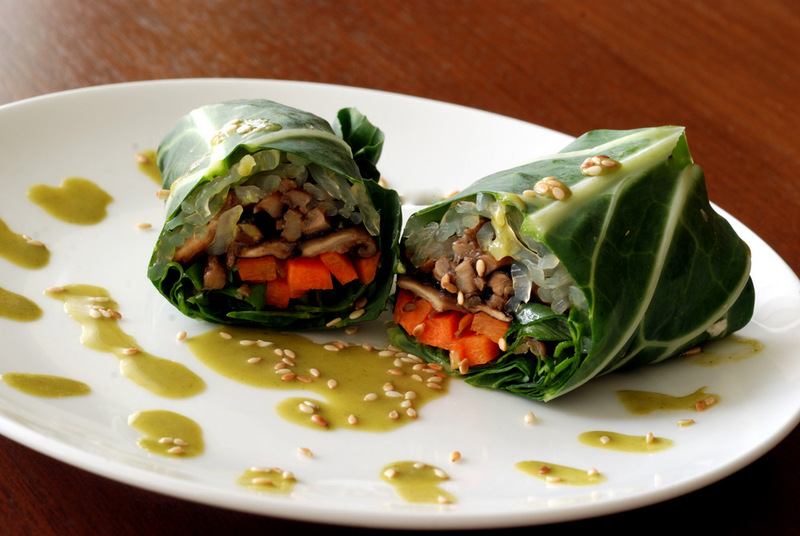 And I love your use of greens for a Thai wrap, not to mention kelp noodles – which I definitely have to check out. Thanks so much for sharing with Presto Pasta Night. I’m with you on the cilantro-love camp! And this sauce looks amazing. I’d love to try it on zucchini noodles! !